Thanks to Michael Rakowitz, the Lamassu will stand again. The Northwestern University art theory and practice professor has been commissioned to recreate the Lamassu — a winged bull and protective deity that stood in Nineveh, Iraq, from 700 BC until it was destroyed by ISIS in 2015 — at the Fourth Plinth in London’s famed Trafalgar Square. The Fourth Plinth is one of the world’s most visible and thought-driving public art platforms. 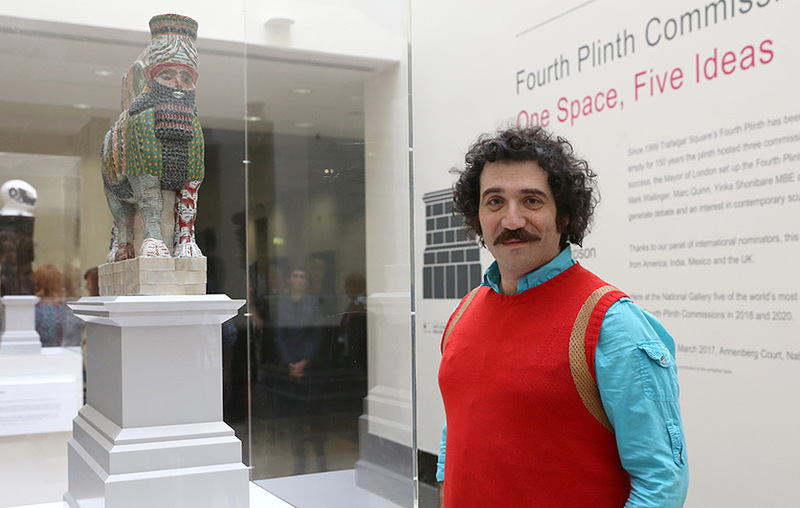 Rakowitz’s sculpture, which will debut in March 2018 and remain until 2020, will be the 12th work to appear on the Fourth Plinth since the public art project’s 1998 launch. The 14-foot sculpture will be constructed of 3,000 to 4,000 empty metal Iraqi date syrup cans, recognizing a once-renowned Iraqi industry that has since been decimated by conflict. “The salvage of date syrup cans make present the human, economic and ecological disasters caused by the Iraq wars and their aftermath,” Rakowitz says. The Lamassu is part of The Invisible Enemy Should Not Exist, Rakowitz’s ongoing, 11-year effort to recreate over 7,000 archeological artifacts looted from the Iraq Museum during the war or destroyed in its aftermath. Thus far, Rakowitz, with the help of some two dozen other artists (including some Northwestern alumni), has completed nearly 700 works using recycled packaging of Middle Eastern foodstuffs and local Arabic newspapers. “It’s clearly a project that is going to outlive me and my studio, which is really the point: history cannot be reconstructed,” says Rakowitz, whose works are displayed in collections around the globe.